In need of a simple, fast weeknight dinner? This is super easy and (slightly) healthier than ordering pizza, but its definitely cheaper, you can definitely make this meal for about $5 total. These also make a great simple appetizer at a football party or last minute gathering, just use a pizza wheel to slice into 1" strips. Preheat broiler on low. Brown sausage in a skillet, drain any excess fat and leave over low heat. Meanwhile, cut bread in half and hollow out the middle of the bread by cutting in a "V" shape. Make sure to leave bread about a 1/2" thick on all sides. You can use the top and bottom to make pizzas or just use the bottom and use the top for garlic bread. It just depends on how much bread I have (since when I do this, I'm usually using leftovers) and how hungry we are. Peel garlic clove and rub whole clove all over the inside of the bread. Mince garlic clove and add to sausage. Put bread on a baking sheet and place under the broiler for about 5 minutes, just until it starts to crisp up. You don't want to over cook the bread at this point or you will end up with burnt pizza. 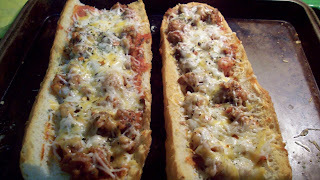 Mix marinara/pizza sauce in with cooked sausage. 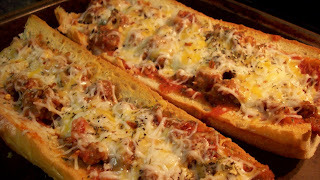 Remove bread from the oven and add meat sauce mixture to the cavity in the bread. Add cheese to the top, sprinkle with Italian seasoning and crushed red pepper flakes and return to the oven for an additional 5-10 minutes until cheese is melted and bread is golden brown. 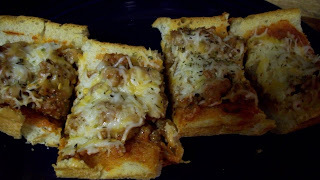 Make-ahead tip: I usually cook a full pound of Italian sausage and add more sauce to a make a meat sauce for pasta or in the case of this week, lasagna roll-ups later in the week. Melt butter in a small bowl with minced garlic. 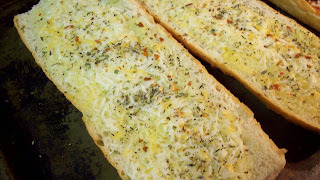 Spread the tops of the French bread from your pizza with butter. Top with cheese and sprinkle with Italian seasoning and crushed red pepper flakes. 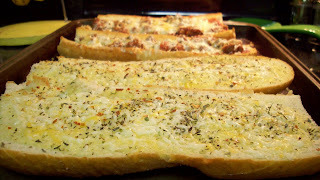 Place on a baking sheet under a broiler on low for 5-10 minutes until cheese is melted and bread is golden brown. Meanwhile mix together marinara sauce, parmesan cheese and garlic powder in a small bowl. Heat in the microwave for about 30 seconds until warm. Serve as dipping sauce.